The complexity of installing an oil interceptor can be influenced by a range of factors including the size of the system, the depth of installation and the ground conditions. We are experienced in supplying and installing a range of oil interceptors and have built expertise in combating a variety of issues. Surveying and managing groundwater levels. Managing surface water drainage during install. Undertaking geotechnical investigations into the suitability of the ground conditions. Installing and commissioning any specialist components e.g. high oil alarms (which need to be set at the correct level). As part of the design stage the size and specification of the system should have considered risks associated with liquids and solids stored on site. The location should capture run-off from all viable contaminant source areas and provide a final compliance point for liquids leaving site. The location should also consider the presence of utility service lines such as electricity, water and telecoms. 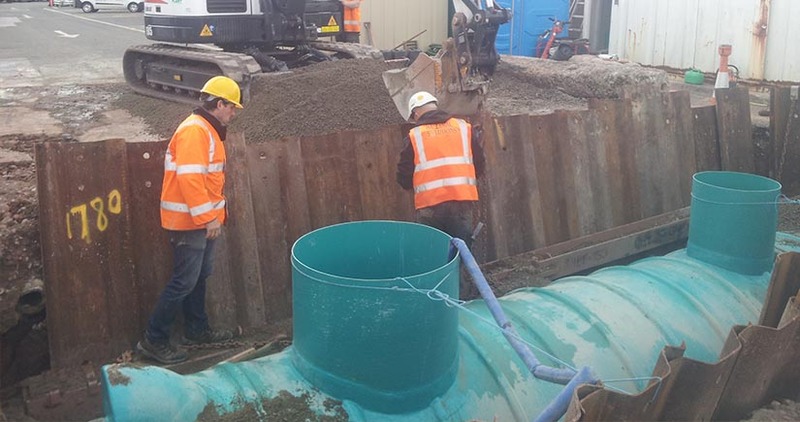 The installation is also likely to require drainage alterations to facilitate a new interceptor and these works need to be coordinated for minimum impact upon site operations potentially requiring over-pumping of surface water run-off through temporary control systems such as an oil water interceptor. The local ground levels will need to be checked to ensure that light liquids (oils) cannot escape from the interceptor or the extension shafts. Groundwater ingress during excavations may also need careful management during the install and commissioning stage of the install. GPT do not see the commissioning of the interceptor as the end of our responsibilities but the beginning - we will provide a monitoring and maintenance plan for the safe, efficient and economical operation for the life of what is a significant investment. 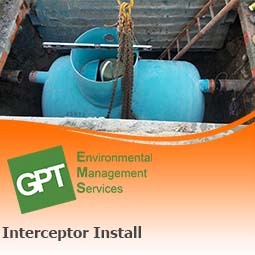 We are able to supply and install all makes of interceptor including SPEL, Morclean, Kingspan, Klargester, Conder, Premier Tech Aqua and Camplas. Our expertise with interceptors means that we are able to install all types of interceptor class 1 (class I), class 2 (class II), by-pass and full retention. We are also experienced in installing all makes of interceptor alarms including Labkotec, Darcy, Aquasentry, Pyramid, Kingspan. "To be effective, oil separators need to be correctly designed, installed and maintained."